Everyone wants to make sure they’re disposing of hazardous waste properly. But how do you know if something is hazardous? Read more below for some tips for identifying hazardous waste in your house, garage, garden, and workshop. Chemicals are sorted for proper disposal. Cleaning products such as oven cleaners, drain cleaners, polishes, tub and tile cleaners, disinfectants, and ammonia-based cleaners are some of the hazardous chemicals found in your home. How do you know if a substance is hazardous? Look for the words DANGER, WARNING, or CAUTION on the label. “Danger” signifies the most hazardous; “caution” means less hazardous. How should you handle hazardous household cleaners? READ AND FOLLOW ALL LABEL DIRECTIONS! Don’t mix chemicals, and never discard on the ground or down the drain unless it is specifically designed to be disposed of down the drain. If the product is designed to go down the drain as part of its natural use, it can be flushed down with running water. 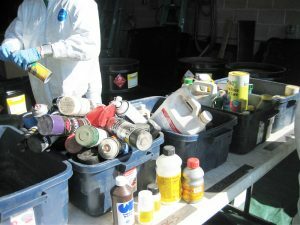 If you can’t use up or give away these cleaning products, bring them to a household hazardous waste cleanup event. You should use up or give away what you can. What’s left over can be brought to a mobile collection event or directly to the Regional Collection Center (RCC) in Bondurant. Motor oil and lead acid batteries cannot be brought to the mobile collection events but may be brought directly to the SCISWA Landfill or the Poweshiek Transfer Station. The best way to dispose of any excess yard and garden chemicals is to use them up according to directions. Do not use banned pesticides. Small quantities of these chemicals will be accepted at mobile collection events if they are from your home. If you cannot use up or give away these items and they come from your home, you may bring them to a mobile collection event or take them directly to the Regional Collection Center (RCC) in Bondurant. For more information regarding home, garden, workshop, and garage chemicals, call SCISWA at 641-828-8545. If you are a business or farm that is a conditionally exempt small quantity generator (generates less than 220 pounds per month), you can participate in our small business services. Call SCISWA at 641-828-8545.